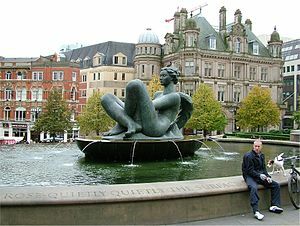 The nickname ‘The Floozie in the Jacuzzi’ was affectionately applied by local people to the fountain ‘The River’ by Dhruva Mistry when he won an international competition in 1992 as part of the redesign of Victoria Square in Birmingham. The immense cross-legged reclining figure in the upper pool forms one of the elements of the fountain, below which are two smaller figures representing ‘Youth’, also by Dhruva Mistry. The square with its fountain was officially opened in 1994 by Diana, Princess of Wales and the sculpture weighs in at 1.75 tonnes. At 9ft tall and 13ft long, it is a truly monumental work of art which perfectly suits the scale of the surrounding pedestrianised area. The figure is voluptuous and powerful and is said by Mistry to represent life force. Regrettably over the years there were problems with leakage in the fountain, and it was not until 2010 that a three month restoration of the sculpture and its surrounding pool costing £300,000 was carried out. Dhruva Mistry was born in Kanjari, India in 1957. He studied sculpture at the University of Baroda, before coming to the U.K to complete his training at the Royal College of Art on a British Council Scholarship. He had great success in Europe with exhibitions and many public commissions, but in 1997 he returned to his native India where he now lives and works in Vadodara. If you are not already on my emailing contact list, please let me know so that I can send you news and details of my exhibitions. Just email me at info@johnbrown-sculptor.co.uk.